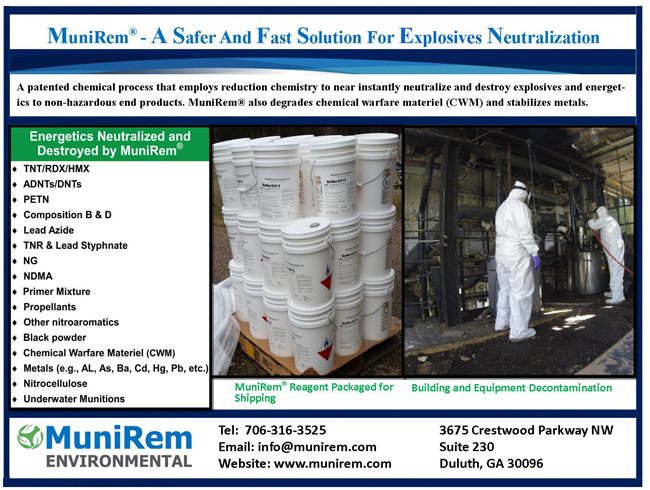 MuniRem Environmental (MRE) is an industry leader in providing chemistry that near instantly neutralize and destroys explosives and other energetics to non-hazardous end products. Our MuniRem product degrades energetics and chemical warfare materiel (CWM), while stabilizing heavy metals as the insoluble metal sulfides. MuniRem is recognized as a safer and faster solution for removing explosive risks from different materials. MRE's award winning innovative green solutions are delivered to its private industry and government clients by highly qualified, dedicated and driven staff of engineers, scientists and UXO professionals. MuniRem has been applied at diverse Munitions and Explosives of concern (MEC) project sites in the United States and internationally. For more information visit our website at: www.munirem.com.